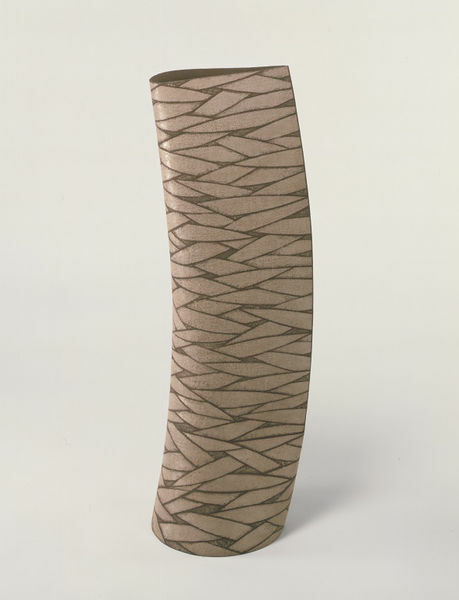 Highly sensitive to the potential of the vessel form, Kuriki Tatsusuke (b.1943) is an artist who has pursued his aims with techniques of ever-increasing refinement. Born into a traditional ceramic-making family in Seto, he developed his interest in ceramic sculpture as a student at Kyoto City University of Arts, from which he graduated in 1966 and to which he returned to teach in 1984. During the last ten years his work has revolved around two main themes. In his silver and green series he explores the use of wide interlacing bands if silver on round, slightly asymmetrical forms. 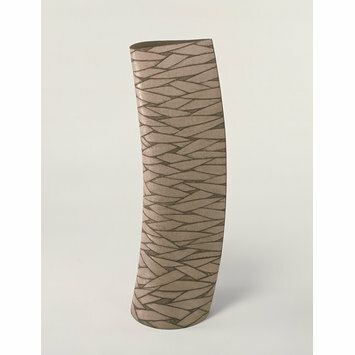 In his silver and red series he examines the cylinder as a fundamental shape. It is to the latter series that the work shown here belongs. Starting from a round base, the front slopes inwards to a line a quarter of the way up the height of the vessel. Above this level the shape is that of a gradually tapering aileron. The sharpness of the right-hand edge is accentuated by the gently curving profile of the overall form. The surface pattern has been worked out with extreme care, each element of the resist design having been precisely positioned with the aid of a paper stencil. The application of iron-bearing slip followed by a thin layer of silvery glaze gives the work its subdued but distinctive coloration. The trunk-like shape and leaf-like pattering of this and other works in Kurita's silver and red series may be read on one level as a straightforward expression of his fascination with the natural world. More profoundly, however, they are a reflection of his interest in the processes of creation and the evolution of forms in relation to the nature of their materials.